Arrr, me hearties, we’re off to Rum Island, where treasure be found. Not gold doubloons, but crates of strong Indian rum that got hid two centuries ago. 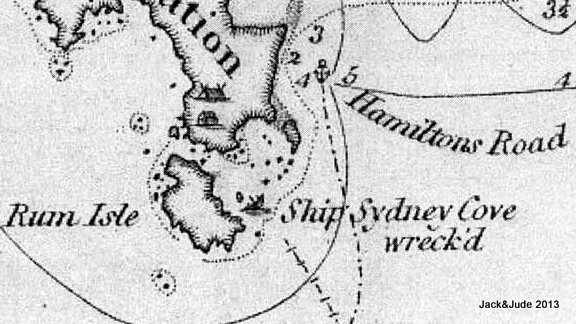 Twas long before Franklin and Flinders became famous, when the fledgling Colony was run by the Corps, that’s when Captain Hamilton beached the sinking Sydney Cove. Aye, with water up to the lower-deck hatches he run her up on what’s become Preservation Island in the Furneaux Group. His crew, thankful to be saved from that almighty storm, starting breaking open the grog for a wild time, until her good captain shifted the last crates onto a small offshore island – Rum Island she’s come to be known. Roll the clock forward to present day, it’s no longer February of 1797 and the good ship Banyandah is slipping along in the Sydney Cove’s wake. Away westward, land slips below the horizon as we enter turbulent waters, ahead a strange collection of motley islands. Some tall and stately, others squat and treeless, all lined with gigantic boulders tinged red. Buff in colour like winter wheat, these giant pillars stand as if guarding those shores from wild weather known as the Roaring Forties. Captain Hamilton thought he was entering a well-protected bay, but he was traversing the much-respected Banks Strait. Matthew Flinders was sent to reconnoitrer the wrecked Sydney Cove’s and became suspicious that it was a strait and not the southern extremity of Terra Australis. 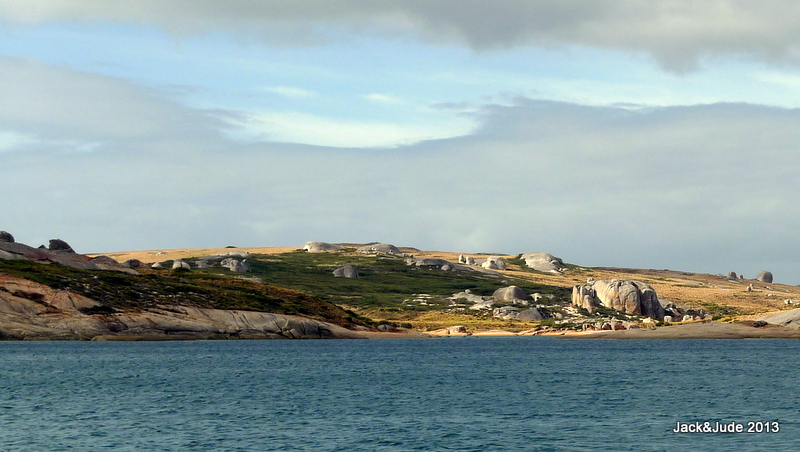 The North East Coast of Tasmania does not have any secure anchorages except St Helens which is dangerous to enter. 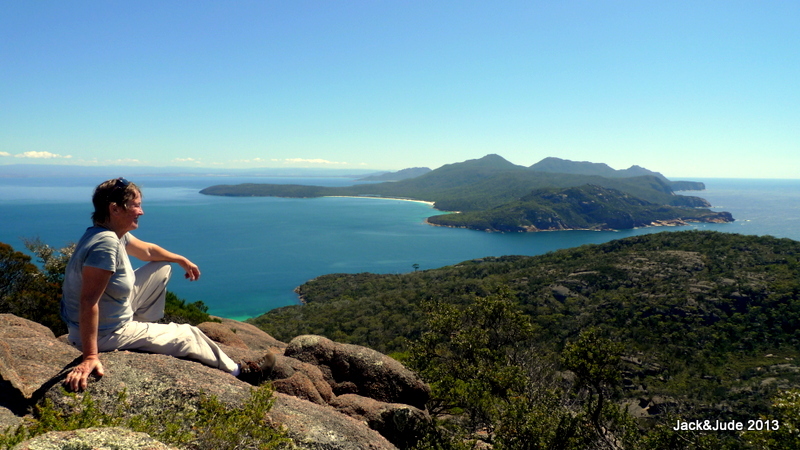 Schouten Island and the Freycinet Peninsula are the last to offer protection from all weather. After it lays a hundred odd miles with a few small nicks offering scant protection from southerly winds. In summer, easterlies prevail, and even when the wind turns south, the easterly swell can make these hidey-holes a living hell. 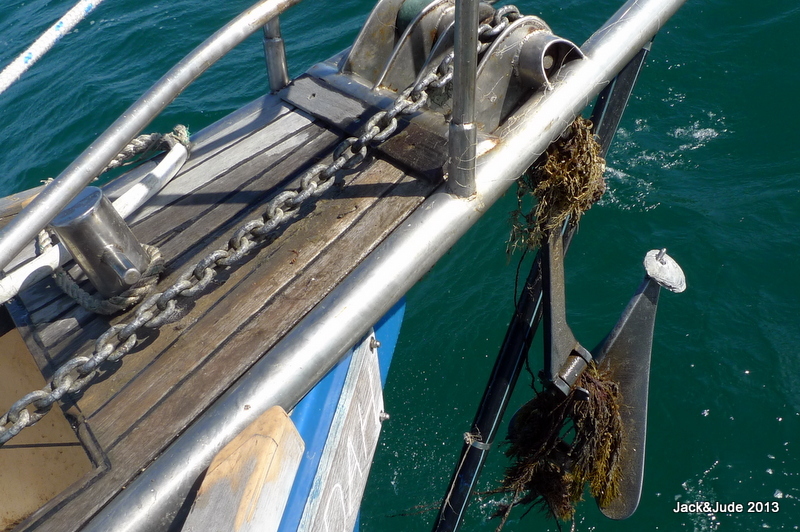 With the strong currents flowing through Banks Strait, careful planning is required to negotiate this part of Tasmania. After our nearly two months of hard yakka on the hard at the Kettering Marina, February’s halcyon weather brought an intense desire to be on honeymoon aboard our Banyandah. Originally we had planned to move her north to a safe berth then return by land to Hobart’s Wooden Boat Show. 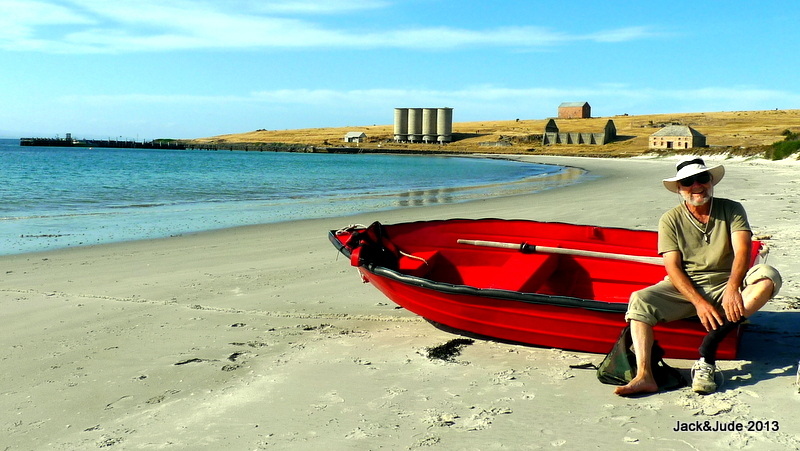 But the fine, warm weather found us lazing in bed, strolling Maria Island’s lonely beaches and taking our Green Machine on slow paddles exploring nooks to do a bit of fishing. Seems the boat show would have to wait a couple more years. Plus, we had a few issues to resolve. 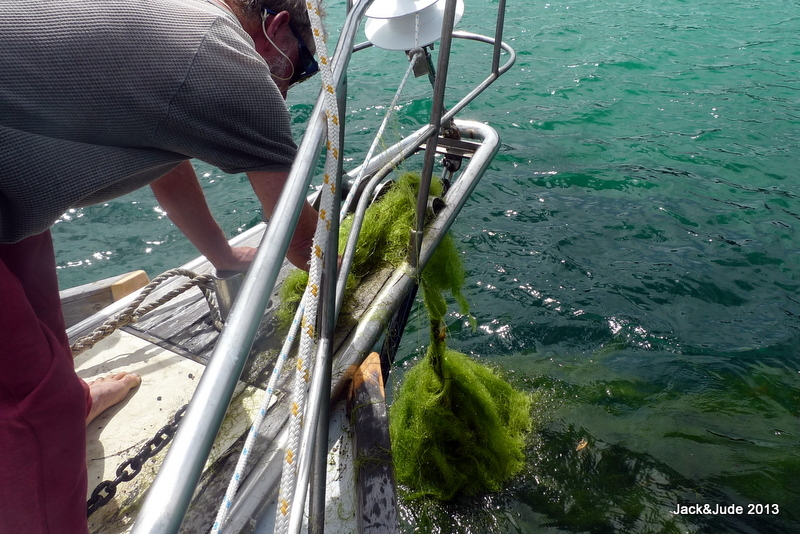 Our newly acquired mainsail from hell needed more than a little thought on how we’d reef it and we still had to determine a course of action to fix it, requiring careful inspection under load. The other issue is my bad shoulder. The muscle I tore during our refit is causing not only a lot of pain, it makes running our ship even more challenging. Ever try hauling up a mainsail or grinding in a full headsail with a lame shoulder? It hurts. Yeah, I know, I’m becoming a wimp, but I just had to ask my dear lady if she’d be my winch wench. Look lads, if we could make a pattern from Jude, and mass-produce her, we’d be in heaven for all of our lives. She cooks, loves to helm, she can row a tinny, hates outboards or motoring anywhere and loves exploring dangerous isolated places. And now she grinds in the headsail when I can’t. Pain be damned. My shoulder will fix itself in time. So we keep paddling our kayak, have a few swims, while I take copious amounts of panadol. A few coldies certainly help. and you might be planning your very own trip. The Van Diemen’s Land Circumnavigation crowd caught up to us there, more than forty boats. That seems a good way to sail around Tasmania. Every two years, in conjunction with the Wooden Boat Show, The Royal Yacht Club of Tasmania organises a circumnavigation, 800 NM taking about 45 days. Logistical support includes several radio relay boats and a loose itinerary that you and your friends can arrange to suit any special places you may want to visit. Weekly get-togethers, dinners and BBQs are organised to help keep the fleet in touch. While the fleet was at Freycinet, a strong northerly attacked. Banyandah prefers to be away from the throng in bad weather so we hid in Hazard Bay. What a mistake. Those strong northerlies blew bullets like cannon fire blasting down those steep mountain slopes that knocked us about until we dragged. When daylight returned, sleepy eyed and out of condition we lugged our 65-pound admiralty up from under the saloon floor. Oh well, it would be needed in the Furneaux Group. Why we dragged? Pierced a shell ! As everyone knows, Tasmania’s weather can change in an eye-blink. Going to bed cowering from a viscous northerly we awoke with a southerly putting our bum to shore. Time to move. And in a sparrow’s fart we were hauling up our modified admiralty and motoring into Cook’s Corner for an early morning kayak that yielded two flathead and a squid. Most of the fleet left that afternoon, heading north towards Banks Strait, taking the southerly that was then blowing 20 knots with rain showers. Everyone was planning to traverse those straits mid-next day to have the tide favourable; otherwise it would be mountainous with wind against fast currents. We opted out. The next morning dawned blue and clear, so Jude and I took the track starting in Cook’s Corner through forests to climb Freycinet Peak at 600 metres for views worth the arduous climb. And later that day, after a quick tidy up to cinch everything down, we were sailing out Schouten Pass, hoping we’d not left too late for the wind. Systems hurtle through down here. As the sun sank behind those magnificent red mountains called The Hazards at Wineglass Bay, the now cooling sea breeze intensified to a mild 12 knots, and Banyandah with her clean bottom just scooted along under a mantle of brilliant southern stars. Her motion so sweet, both Jude and I managed pretty lovely sleeps. Next morning at dawn, as St Helens slipped past on the distant horizon, our trolling line enticed a very nice 3 kg tuna to bite. Yum! For our first overnight sail in quite a few months, it doesn’t get any better than that. By late that day we were flying along in light winds, 5 knots on the log, 8 over the ground, into Snug Cove on the western end of Clarke Island, the third largest in the Furneaux Group. Wow! Did these two grandparents sleep soundly that night. Captain Hamilton piloting his waterlogged ship must have passed that very same anchorage when seeking salvation for himself and his men. And he must have seen just a few miles ahead the yellow white sand of a long beach almost dead downwind of the gale blowing. With the pumps not able to stem the flow, he made the decision to run his cargo up on that shore. And that set in play circumstances that eventually lead to the discovery of Bass Strait. This is where history was made in 1797 – Matthew Flinders first discovered Bass Strait here. We love history and we love taking our vessel to remote locations that are important to our development, and then stand in our cockpit conjuring up images of history taking place. Hi Banyandah... you were'nt plugging up the E coast of Tasmania last Nov heading N by any chance... your boat looks kinda familiar..
Southace, interesting post - for me anyway as I think that Southern Tassie is a perfect cruising ground BUT I couldn't get much past the first quarter of your writings. Don't want to sound like a pain, but next time, could you please break it up with some paragraphs . I know sorry I cut it from my mates email. I really couldn't see myself editing it tonight! G'dday from Strzlekci, Magic spot this one. Especially under clear blue skies and blazing sun. Boatman61 It wasn't us you saw. We were hard at work scraping and painting Banyandah at Kettering. To the others: thanks heaps, glad you enjoyed our blog. From time to time we write one and put it up on our website, and thought I'd spread it about this time as Rum Island is so interesting. 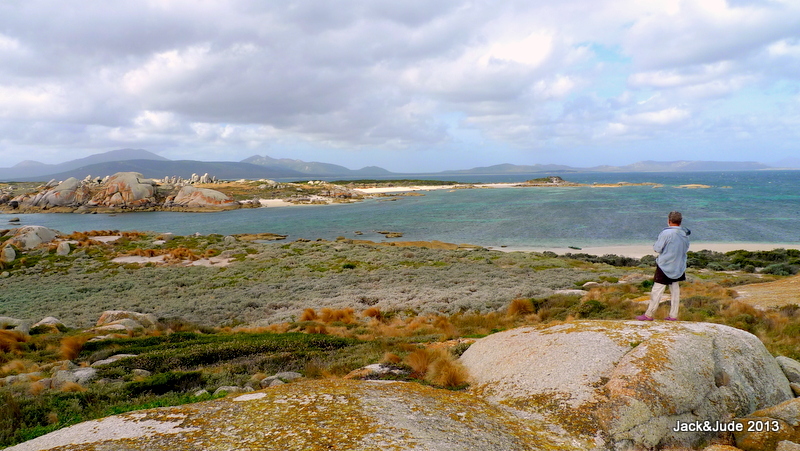 Cape Barren Island is also interesting. We enjoyed morning tea with the island's ex-school principal. For 20 years she educated the islands 10 to 15 children. Now she's had enough. Of course she's a bit long in the tooth. But they built a high school, an extra classroom for the 3 HS aged students, and now have two full time teachers and two teachers aide.